There are other packages available (listed at the end), but not at the retail store that we went to. We chose the larger of the 2 packages that were there. We also purchased a package of 2 extra contact sensors. Recommended for an apartment, dorm, studio, or smaller house. 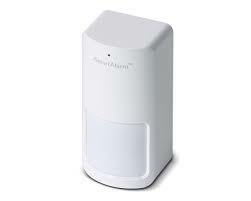 Supports iCamera video cameras (1st Generation and iCamera KEEP), and all iSmartAlarm devices. Almost infinitely expandable. Built-in 110-decibel siren – louder than a car horn. Distance: <100m (Outdoor, open space). Identify trouble anywhere within 30 feet. Be notified instantly of intruders. For use in the kitchen, living room, spare room, garage, home office, or hallway. Give a Remote to anyone in the family as a dedicated identification key, so even if they are too young for a phone, or they don’t have a smartphone, they can still control the system and be monitored. 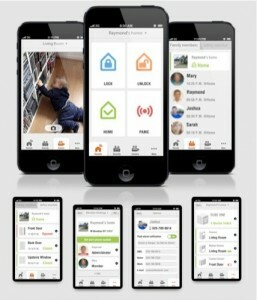 Control your system from anywhere in the home. Track your children and pets. 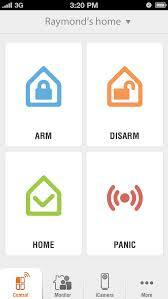 Arm and Disarm your alarm using the Remote Tag. 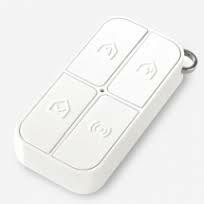 Use the Remote Tag to set off the alarm in case of intruder or when you need help, even if the iSmartAlarm is not Armed, such as in case of a fall or medical emergency. Easily placed at any door or window opening using two-sided adhesive tape (included). Removeable and maveable – Can be used on a door today, a window tomorrow. For use with: doors, sliding doors, cleaning supply cupboard, refrigerator, windows, drawers, liquor cabinet, pool gate. 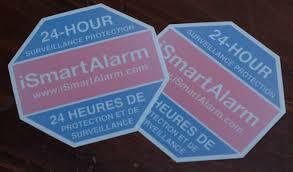 Deter burglars and break-ins with the small, but visible, window stickers. We also purchased an extra package of 2 contact sensors. The ‘Preferred Package is available from Best Buy for $199.99US online (or from BestBuy.ca for $229.99CDN), or from Amazon for $199.99US (at time of publish, it was on sale for $165.99US). 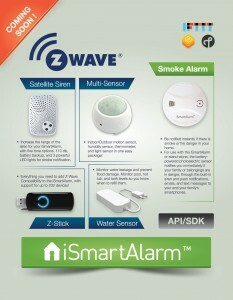 You can also get it from the iSmartAlarm website for $229US, but at time of publish their website was down. Our house is 1700 sq feet, with a basement, and a lot of windows. 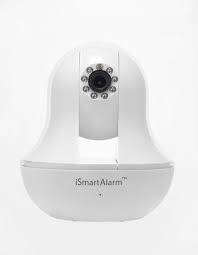 We purchased the larger of the 2 iSmartAlarm packages available at our local big box store. We also purchased a package of 2 extra contact sensors. 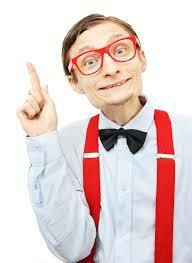 We knew if we searched further locally, we might have found the bigger package (Premium Package), but it was doubtful. We knew we could get it online, but we wanted the instant gratification, plus we didn’t want to lay out a bunch of cash if the system didn’t work. After installation, and ‘playing’ with the system, we wish we would have bought the bigger package, but we can always get the additional accessories separately. Although we’ll likely have to buy online, as our local box store didn’t carry much at all (just the ‘Preferred Package’, ‘CubeOne’ separately, packages of 2 contact sensors, and 1 box of extra remote tags). 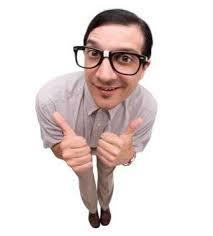 So, unless you live in a larger centre, where the box store has everything & anything in stock, you’ll likely have to special order or buy online. The actual installation was extremely easy. The CubeOne truly was ‘plug-and-play’. We plugged it into our router upstairs, and it went through ‘the motions’, and was ready to go. The installation app was easy to find on GooglePlay with a quick search. The installation app prompted us to update the outdated firmware, which took all of 60 seconds to download & update. The 7 devices (4 contact sensors, 2 remote tags, and 1 motion sensor) linked to CubeOne instantaneously, and we could see them on the smartphone screen. The only trouble we had was when we went to link up another smartphone to the group. We didn’t know if we should ‘join’ or ‘create new user’. Thinking that the 2nd smartphone was a ‘new user’, we went with that. FAIL. If you’re joining up a 2nd (or 3rd, or 4th) smartphone to the group, make sure you ‘join’. 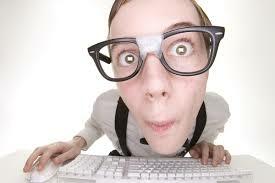 Also – when it asks for ‘username’ DO NOT put in the username of the 1st smartphone, or else you will disconnect that smartphone (and yours will have identity crisis). Make sure you make up your own ‘username’. After this, though, we had no problems signing up a 3rd smartphone user. One thing we are still having problems figuring out, is how to make a 2nd smartphone an ‘administrator’ as well as the 1st smartphone. We still haven’t figured that out. We weren’t sure how the contact sensor was going to work on our back door, as the door opens to the outside, thus we had to put the sensors at a 45° angle. Works perfectly. No issues whatsoever. 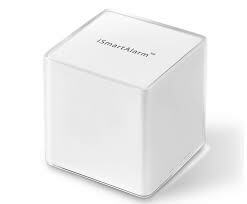 You can set the delay on the alarm (the time between a sensor is triggered, and the time that the alarm starts going full-tilt). We set ours at 1 minute. Yes, it means I have to rush around to turn it off from my phone (which is never in my pocket, where it should be). However, it is enough time, if you rush. I don’t want to give anyone that breaks in more time than that, before the alarm goes, because an awful lot can happen, even in just 1 minute. 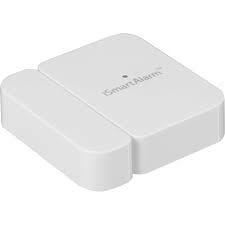 It does give you a beeping ‘count-down’ to warn you that you forgot to disarm the alarm, or to warn intruders that there is an alarm in the house. I would also make sure that ‘CubeOne’ is out-of-sight, and can’t be easily seen within that 1 minute. The count-down beep is clearly coming from CubeOne and really, all they have to do is unplug it. You would get a notification on your phone if it was unplugged. 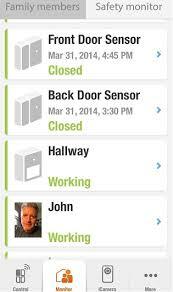 You can set your phone to receive ‘notifications’ whenever a sensor is triggered, even when the system isn’t armed. However, unless you really need to know when a door or window is opened (and closed again), I wouldn’t use this. I ended up getting over 400 notifications in the 1st day & it got a little annoying. What is nice, that if you want to keep track of when they get home (and either they have one of the remote tags, or the app on their phone), you can still see when they get home, and you can always check if a door or window is open or closed. Really easy to install. Truly is ‘plug-and-play’. Very small footprint. All parts included are very inconspicuous, and don’t take up a lot of room. Probably the most conspicuous part is the motion sensor, which has to be placed 6 1/2 feet off the floor, on a wall with the greatest visibility of the area to be monitored. Would like to be able to ‘safety monitor’ specific contact sensors, without having to receive notifications on every single device. This would be handy if you have a teenager in the house that likes to sneak out through their window. During setup, to add additional users/smartphones to be linked. It asks you to ‘log in’ or ‘create new user’. The instructions are not very clear on which you should pick. I picked ‘log in’ the first time, and ended up having to uninstall the App and reinstall it before doing it correctly. To add additional smartphone/user, click ‘create new user’. 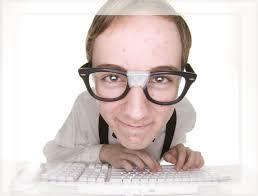 Pick a nickname that you want for your phone, and your own password. Then click ‘join’. Other than the brief wrong turn, adding an additional smartphone/user was really easy. In all, I was very impressed. 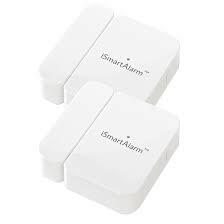 For a D-I-Y alarm system I found it priced very reasonably, and extremely easy to install. I give the iSmartAlarm 4 Geeks. Premium Package: Recommended for a medium sized house. 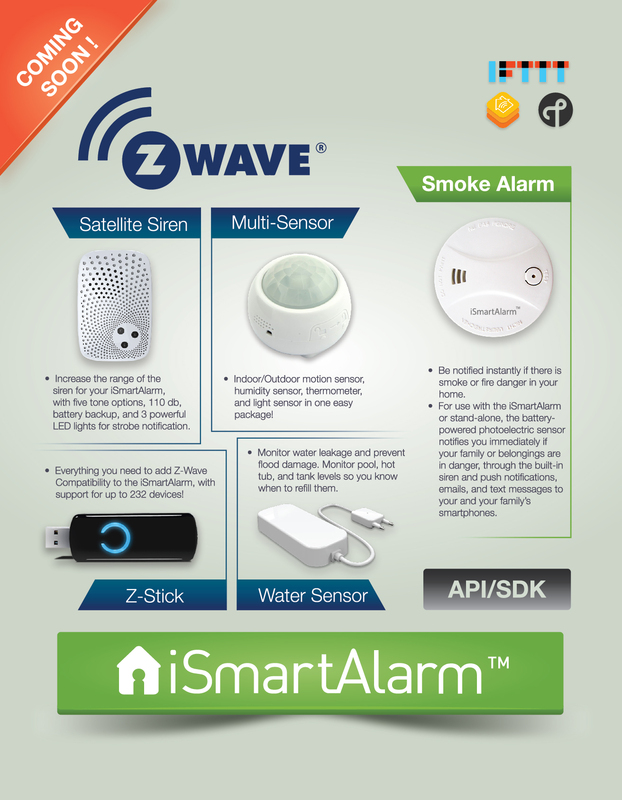 Includes: 1 CubeOne, 1 iCamera, 2 Door/Window Sensors, 1 Motion Sensor, 2 Remote Tags, 2 iSmartAlarm Stickers. Use your phone to control the pan and tilt, and view streaming video. Automatically take and receive pictures if anything is amiss. Manually take pictures at any time, from anywhere with your phone and save them to the cloud to access later. Wireless communication with the CubeOne and with you. Night Vision Distance: at 0.5 lux, viewing angle not less than 30°, able to view detail at 10 m.
Maximum Working Distance: 100 m (300 feet) in open space. 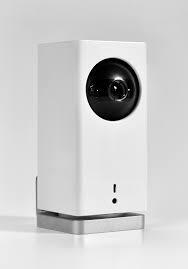 HD resolution, motion and audio detection, and on-demand streaming video control – the iCamera KEEP provides comprehensive home visibility with free video capture and storage.